UC Santa Cruz leaders will break ground at noon Thursday, Nov. 3, on the historic Quarry Amphitheater’s restoration. Despite its central role in campus life since its opening in 1967, the amphitheater fell into disrepair. As a result, events were discontinued in 2006 leaving a void in the heart of campus. As part of the Campaign for UC Santa Cruz, the amphitheater will be restored and reopened for fall 2017. The $8 million project was largely supported by the Student Fee Advisory Committee, which gave $6.388 million to move the effort forward. Alumni, faculty, staff, students, and donors also pitched in to get the project moving forward. UC Santa Cruz will continue to raise funds to support the Quarry Ampitheather’s revival. 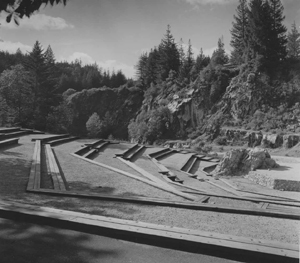 Carved from a former working quarry amidst redwoods and rocky outcroppings, the amphitheater dramatically showcases the deep connection between the campus, its history, and the natural landscape. Designed in the early ’60s by modernist landscape architect Robert Royston, its asymmetrical terraces and sunny park-like character highlight the surroundings. Plans for restoring the amphitheater envision a newly invigorated, inviting cultural space that retains its natural beauty. While some features will be upgraded, one that will be taken back to its original state is “the rock,” an outcropping that dramatically pierces the stage. The project feasibility study calls for both restoration and new enhancements. The initial construction will provide accessibility, building code, life safety, and basic operational upgrades to support performances, events and casual daily use of the venue. Additionally, seating will be expanded from current 1,636 to 2,000; stairs, ramps, handrails, lighting, and overall access will be improved; and provisions will be made for portable infrastructure to support events.